Great property for families and/or business executives. Charming English Tudor style "cottage" in central historic neighborhood. Home is equipped with wood-burning fireplace, washer and dryer, stainless steel appliances, integrated A/V system, exterior safety cameras, exterior landscape lighting, remote controlled driveway gate, single car garage and many other amenities. Cozy screened-in porch w/seating areas and exterior television overlooks beautifully and professionally landscaped and maintained backyard with a 50 (+) year old pecan tree. Ceiling fans in all 3 bedrooms. Beautifully furnished. Master bath has deep soaking air tub and walk-in shower. 2 living areas. Rooftop deck with seating. The cottage is situated in a friendly, safe and desirable historic neighborhood. This home is ideally located near the highway and just a short drive from the airport. 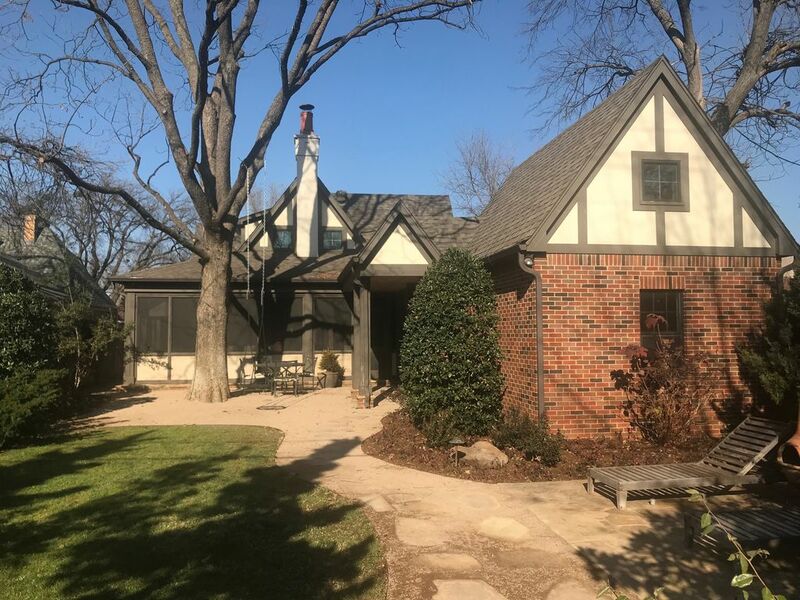 Other desirable OKC spots such as Oklahoma City University, the Plaza District, Downtown, Midtown, Film Row, the State Fairgrounds and the Paseo Arts District are within minutes of this truly well-appointed home. Private pilates lessons are available by request. Great cottage for our family get together. Updated appliances, roomy areas, and love the backyard! Cute cottage with everything we needed! We stayed here for 2 nights while in OKC visiting family. It was PERFECT for our family, and we loved that the backyard was private so the boys could play. Five stars all the way !!! This house is spotless and all the amenity's are high quality and function with no issues. The owner did not take any shortcuts it is decorated tastefully and creates a very pleasant place to stay and explore OKC . You are close to everything and the neighborhood is a real gem with great architecture and lots of curb appeal. This is a great place for couples or a family and real bargain for such an outstanding well appointed home. The owner has spent a great deal of time and money making it a real showplace that their guests will envy and enjoy . Thank you very much for your kind review. I’m so glad your family enjoyed your stay at the cottage. Very nice property. Very good location. Beautiful interior and packed with everything you need to cook and be comfortable. 2 bedrooms downstairs and one upstairs. Upstairs also has a seating area. Great communication and Kelly was very helpful! Would recommend!! Beautiful and functional home for a family of 6. It was perfect in every way. Immaculately kept, thoughtfully stocked kitchen, the most softest and comfortable beds and living room seating. Wonderful memories made. Thank you Kelly! Our stay was perfect! You will not find a more charming, beautifully decorated or spotlessly clean home in all of OKC! If we need a home away from home again, we know where to go.